D.Module2 system functionality can be easily extended usng the FMC site provided by the D.Module2-Base-FMC prototying and evaluation platform. The D.Module2.Base-FMC functions as a power supply and carrier board for a D.Module2 FPGA board and associated DSP processor board. An FMC site enables the use of industry- standard mezzanine boards, supporting capabilities such as high bandwith A/D and D/A, Video and Camera interfacing, Digital Radio frontends, etc. The D.Module2.Base-FMC connects the FMC site with a D.Module2 FPGA board. 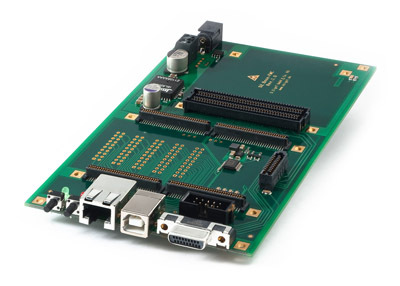 Any of the D.Module2 DSP boards can be mounted (stacked) on top of and used with the FPGA board, thereby establishing a combine resource set of high performance DSP, high density FPGA, and FMC based high bandwidth I/O capability. An extensive range of FMCs are available, from a variety of developers, providing a low cost mechanism for establishing device specific I/O functionality at low harware cost and minimal integration effort. Developers can leverage this capability to rapidly prototype a complete system, with minimal hardware design effort or the associated hardware design risks. FMC integration services are available for customers wanting to minimize their own time and effort involved in establishing a suitable, ready-to-use combination of DSP, FPGA, and FMC resources. Typically, this would involve providing a VHDL framework for the FPGA that establishes an agreed level of connectivity with the FMC. Please contact Traquair to discuss requirements.